The stars seemed to explode through the deep winter night sky as I left our hilly farm and drove towards Lanesboro, Minnesota. It was the night before Christmas Eve, and I was anxious to sing carols, laugh, and be amazed at the annual gathering at the cozy St. Mane Theater. My spirits continued to rise as the performance neared its culmination in the appearance, like Santa Claus, of elderly Norwegian farmer Bertram Boyum. He brings stories and songs from his childhood spent riding in sleighs and wagons, speaking Norwegian, and living on a farm like our own. Then he began to sing Silent Night in Norwegian, and I was mentally transported to 1881. I heard my great-grandfather Arne Stemsrud sing the same carol in Norwegian in his husky farmer’s voice to my grandfather Martin. It was their first Christmas in America (USA) and they were living in a dugout along the banks of the Lac Qui Parle River near Dawson, in western Minnesota. They may have sung this in the Norwegian church or at home by the fire. Neither Arne nor his wife Olaug ever learned English, as they were already nearly 50 years old. Grandpa Stemsrud went on to become a state senator and community leader, but that first cold winter perhaps he found comfort in the song Silent Night in his native tongue. wife of Frank Houseman. I have written a dance-drama based on stories of four generations of the maternal side of the family, “No Home But the Heart: An Assembly of Memories”. It was been performed at SUNY-Brockport, University of Lethbridge, and in Ireland, among other places. I am a Native American choreographer working in the USA and Canada. Go to my website daystardance.com, to see photographs and a synopsis of the work. Thanks so much Rosalie for sharing this. Bravo for your successful efforts sharing your heritage through performance. We need more of this. Perhaps we can work together sometime! Hi, my great-grandfather was also named Arne Stemsrud, and also emigrated from Norway to Minnesota in the late 1870s. But he was 9 years old at the time and became one of two doctors in Dawson, Minnesota. He died in the early 1930s. I am almost positive that the picture you reproduce above is one of MY family photos. My grandmother, Arne’s daughter, just died in December at 103, and she still had many family photos. I’m actually not even sure that photo is of the Stemsrud side of the family; I think those pictured may be Lindells. I’ll check with my mom. We are indeed related. Lovely! I hear from another of your relatives. The Arne here is Arne Hansen Stemsrud. I have been to his birthplace in Norway and met relatives over there. His sons were Martin and Arne Stemsrud, and later Ole and Maren. This Arne became the doctor who is your great-grandfather and Martin was my grandfather (I was born very late in my mother’s life.) 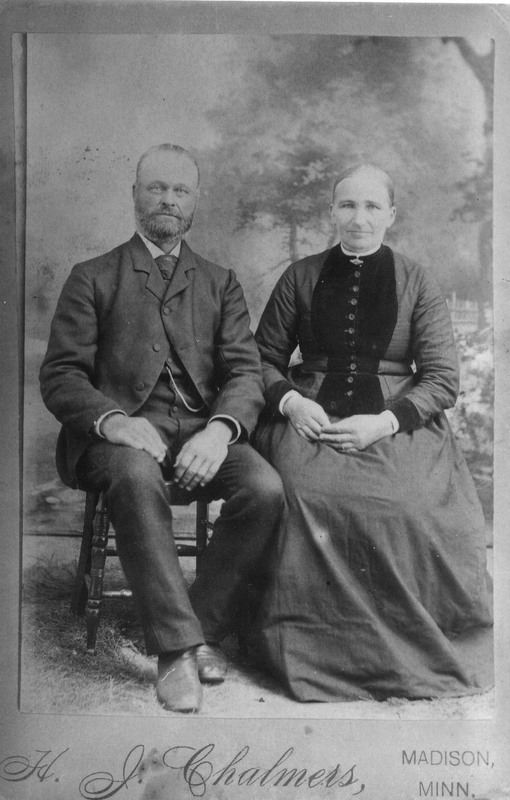 Arne Jr. and Martin are shown in a portrait around the time they immigrated. One was 12 and one was 9. The Arne Hansen Stemsrud is shown in another portrait with his wife. They were in their 50s when they immigrated with Martin and Arne. I still live in MN, if you ever want to connect over photos. Thanks for responding! I figured out the riddle after I posted the comment on your page. My grandmother’s stories of her family in Dawson were selective, and mostly featured idyllic summers on Aunt Maren’s farm with all of her cousins. I would love to see the photos you mention! I believe the only one we have is the one you used above. The Laq Qui biographies indicate that, of the boys, Ole was the oldest, then Martin, then Arne: http://genealogytrails.com/minn/lacquiparle/bios_s.htm#s. Previous post: The first of the Great-great Tales: What’s in a name?